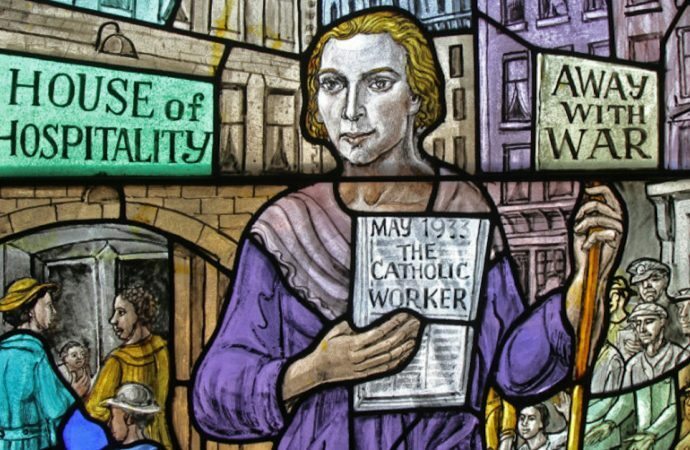 Gregory A. Shemitz | CNS Dorothy Day, co-founder of the Catholic Worker Movement, is depicted in stained glass at Our Lady of Lourdes Church in New York. The departure of John Pelissero last year created a gaping hole in Loyola’s leadership. 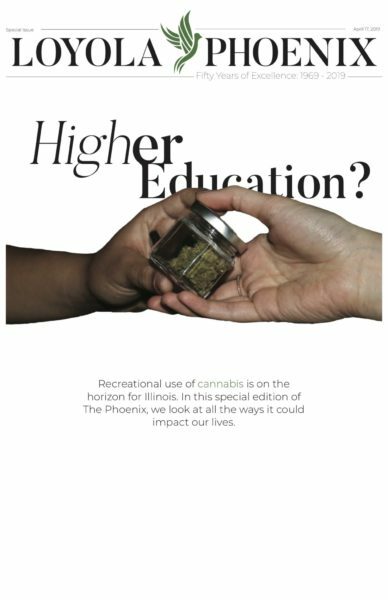 The Provost is the chief academic officer of a university, in charge of the curriculum, faculty and, thus, the university’s core academic mission. Pontius Pilate should be our next provost. It’s true that Pilate has a bad reputation in Christian circles. He did, after all, send Jesus of Nazareth to his death by crucifixion while serving as Procurator or Prefect of Judea. But the Gospels all report he was reluctant to do so, finally acceding only when the assembled crowd demanded Jesus’ death. Pilate was a company man. One strain in Christianity is the radical, fearless witness of God’s truth, be it convenient or not: the prophetic warnings of the Hebrew Bible, Christ’s attacks on the moneylenders and clerical hierarchy of his day, Ignatius of Loyola’s pursuing communion with God, often in a cave, and to the irritation and sometimes alarm of the local representatives of the duly constituted church. Pilate’s is the other strain: the pursuit of influence by close alliance with power, first with the very empire that nailed Jesus to the cross, then with western powers as they expanded into the Americas and Pacific, and now with corporations, the master institutions of our own time. We’re named after Ignatius of Loyola, but Pontius Pilate is our administration’s lodestar these days. Maybe that’s a good thing. Who thinks an effective fundraising technique is to take potential donors to a cave to meet an unkempt religious fanatic? People with nice houses generally don’t want the world set on fire. Consider Loyola’s stance toward its academic workforce’s efforts to unionize. In January 2016, lecturers and adjuncts (the latter of whom are hired course-by-course) voted to unionize, followed shortly thereafter by graduate students who work as graders, section leaders, instructors and research assistants. But Loyola acted like every other corporation in America, where the onslaught against organized labor has contributed to the economic inequality and insecurity that explains much of the nasty tenor of national politics. Following the standard corporate playbook, the university claimed wholesale exemption from labor law as a religious institution, essentially demanding the government let it violate its own principles. When this didn’t work, it stalled, knowing the very conditions that prompted strong votes for unionization — lack of job security, low pay, few or no benefits — make it difficult to maintain momentum or even to meet your fellow instructors. Loyola is currently defying the National Labor Relations Board’s ruling to negotiate with graduate student workers, another standard corporate practice, with negotiations with lecturers finally becoming serious only early March after a strike was authorized. Kelly’s approach, in which the autonomy and power of the institution are goals in and of themselves, rather than means to serve principled ends, seems to be more the rule than the exception. A visiting comedian had his mic cut when he made jokes about the Church’s history of covering up sexual abuse. A faculty search is cancelled when a finalist turns out to have family ties to union leadership. An assistant professor is warned that bringing a controversial speaker to campus might cost him his tenure. Students trying to form Socialist or Palestine-related groups face administrative roadblocks others don’t. Eleventh hour changes prevent an agreement with Loyola’s academic union even as the University of Chicago quickly strikes a deal. Is it crazy to think there’s a kind of Pontius Pilate-like deep state at Loyola? Or at least an entrenched institutional culture that constantly undercuts our professed values? Nobody said Pilate didn’t get the job done. Loyola’s strategy will likely work, because it has a staunch ally in labor relations in the White House. President Trump’s appointees to the National Labor Relations Board and federal courts will in all likelihood rule that graduate students aren’t covered by labor law and perhaps even that the principles of the Hobby Lobby case, which granted religious “beliefs” to corporations, should exempt religious institutions from labor law. This would break the academic unions at Loyola and further weaken what remains of organized labor nationwide. And so Loyola University Chicago, Social Justice University par excellence, turns to Donald Trump, sender of tweets, grabber of women, admirer of dictators, for ammunition in its fight with organized labor. Popes Leo XIII and Francis might have a hard time with that. But Pontius Pilate would understand, and that’s why he should be our next provost. Benjamin H. Johnson, Associate Professor of History at Loyola, edits the Journal of the Gilded Age and Progressive Era. He is the author and editor of seven books. Thank you for speaking truth to power. You have explained how and why the NTT Faculty of the English Language Learning Program (ELLP) are being treated so inequitably by Loyola Unuversity. During last week’s labor negotiations, Loyola’s management team ignored data presented to them by ELLP Faculty on comparable intensive English programs at peer institutions such as DePaul, IIT, and Boston University. Admin also made claims about ELLP instruction, curriculum, and workload that were not based in fact. When ELLP challenged admin with the facts, Patrick Boyle stated simply, “I disagree.” FT ELLP Faculty teach 18 hours/week of academic English a week for 48 weeks a year, a workload much heavier that that of any language faculty in CAS. Furthermore, ELLP Faculty are not compensated for the extra workload they are required to carry year around. Even if they receive the raise offered by admin in negotiations, they will still be paid significantly less than the NTT FT faculty in CAS, despite having terminal degrees in the field of Teaching English as a Second Language/Applied English Linguistics. Admin also argued that because ELLP enrollment is down and there are only four FT ELLP Faculty, the University was not willing to make changes in workload. Whether there are 4 or 40 Faculty teaching in a unit, they should all be treated fairly. Loyola management bargaining team for ELLP Faculty was dismissive, condescending, and disingenuous. What an indignity. Thanks for a thoughtful piece that restates why good Catholics are great abvocates of social justice.